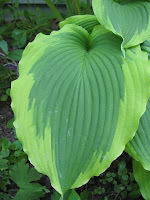 I decided today that my new summer project would be to photo catalog all of the hosta in my gardens. I have been meaning to do this for a while, as I like to see how they change year after year. So today I went out and started taking pictures of all of my hostas. It actually went faster than I thought and I've made it through the F's in the hosta alphabet. I was inspired by another hosta lover from the gardenweb forum. He has a wonderful website of all of his hosta. I recently found out that he is dying of cancer, and am deeply saddened by the news, since he was such an inspiration to many hosta lovers on the web. I encourage you to check out his website, and see if you too are encouraged by his beautiful work.